One important thing to note is that the data processor, Robo, is in charge of initializing all the sensor processors. All communication with the processors should occur through the data processor. The following diagram shows the following relationship. Each box represents a module or collection of modules. A class is only instantiated by the module directly larger than it. In all cases, except for the motor encoders, this means that each object is only being instantiated once. 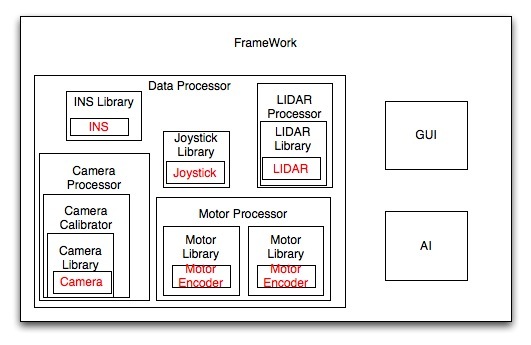 This means only the frame can move data from the processor to the ai. This may not be the most logical design and should be further thought out.